Dive deeper into ZenHub&apos;s robust features. Learn about plans, payments, and more. Use ZenHub with GitHub Enterprise. ZenHub is browser extension that adds robust project management features directly into GitHub&apos;s UI, making centralized collaboration on GitHub faster, more visual, and less cluttered. With ZenHub installed, your team stays lean and agile: you can plan sprints, create epics, and visualize your workflow without leaving GitHub. Is ZenHub available on browsers other than Chrome? Currently, the ZenHub Extension is available for Google Chrome and Mozilla Firefox. While we work toward supporting other browsers, the ZenHub Webapp is available for Safari and mobile. Visit our public portal to add your browser suggestions. How do I know that ZenHub is installed? You&apos;ll see a blue and white Z button added to the right of your address bar. Click this button to open the Notification Center displaying your team&apos;s recent activity. The Notification Center allows you to sign in and out, seek help, visit the Dashboard, and more. If I use Chrome and Firefox, do I have to download ZenHub twice? Yes, you&apos;ll need to add ZenHub to both browsers. Simply visit ZenHub.com, click Add the extension, then sign in with your GitHub credentials. Chrome and Firefox will automatically update your extension, but this is not instantaneous. To manually update in Firefox, visit about:addons in your browser, then click the gear icon. To manually update your extension in Chrome, go to chrome://extensions in your browser, check the box beside Developer Mode, then click Update. What happens if I am on a computer without ZenHub installed? You will always be able to access GitHub in its original form and your information will be saved safely. ZenHub features will not be displayed until you install the browser extension. How can I report a bug, get help, or give feedback? We are more than happy to help! Contact an account representative by emailing support@zenhub.com, or visit our public portal to leave feedback. When reporting a bug, include steps to reproduce and screenshots to help us fix it as soon as possible. How can I add a ZenHub badge to my GitHub repo? Add your request to our public portal. Don&apos;t forget to vote on current initiatives to show support for others&apos; requests! How do I connect several repos into one Board? ZenHub&apos;s Boards support multiple repositories, making organization-wide collaboration seamless. Connecting multiple repos in one Board is easy: first, navigate to any ZenHub Board. Click Repos, then click Add Repos +. In the next screen, you can easily customize the new Board&apos;s structure. In the preview screen, drag and drop pipelines to determine how they will be merged. (You can always fine-tune these configurations later.) When you have finished organizing, click Merge. Note that once you merge repositories here, you can also create Multi-Repo Burndown Charts. Learn more here! How do I invite others to use ZenHub on my repo? You can direct them to ZenHub.com to install ZenHub. Once installed, they will be able to view your boards, epics, reports, and take advantage of other ZenHub features — as long as they have access to your repo. Why can&apos;t I see my organization on the ZenHub Dashboard? Revoke your ZenHub token by going to github.com/settings/applications and clicking Revoke. If you are an admin, you should see Grant Access if not, you will see Request Access. ; Click on whichever of the two options you see. If you clicked Grant Access there are no further actions needed to get access to ZenHub. Please ask the organization&apos;s owner to do to the organization&apos;s Settings page, click Third-party application access policy, head to ZenHub and click review, then grant access as displayed in the screenshots below. 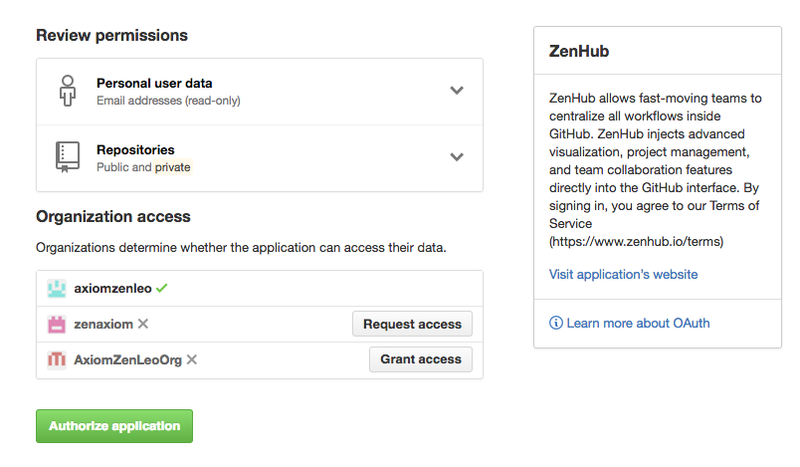 What are the details of ZenHub&apos;s GitHub access permissions? The ZenHub Board for given repositories can be viewed by anyone with Read/Pull access to that repository. Any GitHub user who can view and clone the repository will be able to view the Board. ZenHub Board issue manipulation/reprioritization can be performed by anyone with Write and Admin access to the repository. Any GitHub user who can push to the repository will be able to edit a ZenHub Board for that repository. Who needs to pay for ZenHub? ZenHub is free to use on public, personal, and academic repositories. For teams using private repositories, ZenHub is just five dollars US, per user, per month. Visit our pricing page to learn more about ZenHub pricing and plans. Can I pay yearly for a discount? Yes, you save 17% with annual payments! To pay for ZenHub on an annual basis, click Add Licenses on your Dashboard and select the yearly option. Do I have to pay for every member that is part of my GitHub organization? No — Only the users you want to have access need a ZenHub license. Head to the ZenHub Dashboard to purchase and assign licenses to your team members. ZenHub&apos;s pricing is pay-as-you-go, processed securely by Stripe. Your plan can grow with your team and there are no contracts to sign. ZenHub&apos;s Dashboard is your team&apos;s payment hub, where you can add licenses, make payments, grant administrative permission, and more. What currency are subscriptions charged in? All of our plans are charged in USD. How do I pay for ZenHub? Access your private Payments Dashboard to manage your team&apos;s ZenHub licenses. Under Account details in the Dashboard you can view and edit billing information (including credit card details), cancel your subscription, and view billing history. Can I pay for a subset of team members? Of course — ZenHub admins can easily control licenses via the Manage your plan section of the Dashboard. That said, ZenHub gets more useful the more team members you onboard. How do trials activate? What if we need another one? Fourteen-day trials activate when you visit your organization&apos;s private repositories while signed in to ZenHub. During that time, you can use ZenHub with unlimited team members. Please contact us if your organization would like an extended trial to further evaluate ZenHub and make sure it&apos;s the perfect fit. Who can make a payment on the Dashboard? Your organization&apos;s administrators can control ZenHub&apos;s payment Dashboard; the Dashboard has limited functionality for non-administrators. Note: Whomever makes the initial payment becomes that organization&apos;s administrator. How do I add an admin for my organization? It&apos;s helpful to grant admin capability to several team members. On the Dashboard&apos;s Manage your plan section, locate the person you wish to add and click the three dots beside their name. You will see an option to make them an admin if you are already an admin. We know you&apos;ve chosen GitHub Enterprise to keep your data secure — ZenHub Enterprise installs on your servers, runs behind your firewall and is configurable to your security requirements. All data is stored on machines that you control. If your question is not answered above, we&apos;re happy to help.